That's right! The Read-Along is here. 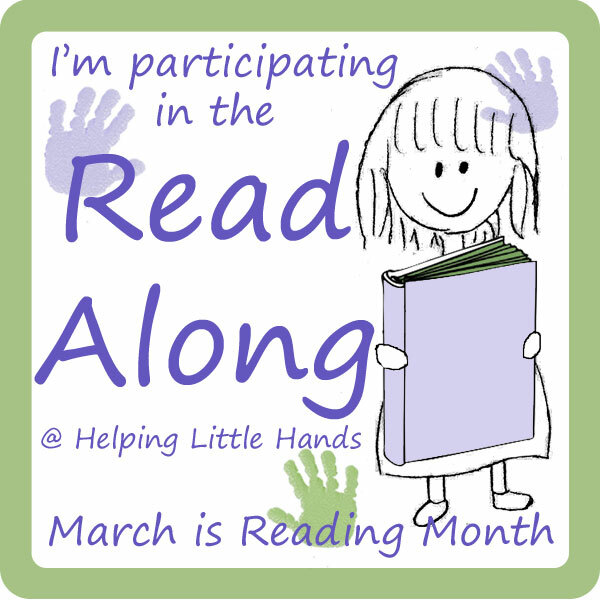 I hope you're ready to be inspired with book ideas for the whole month of March. I've got guest bloggers lined up for EVERY day (except Sundays) all month long. I'll also be posting regularly, so we'll have one or two posts every day. I hope you'll check back often. And yes, you did read the title correctly. 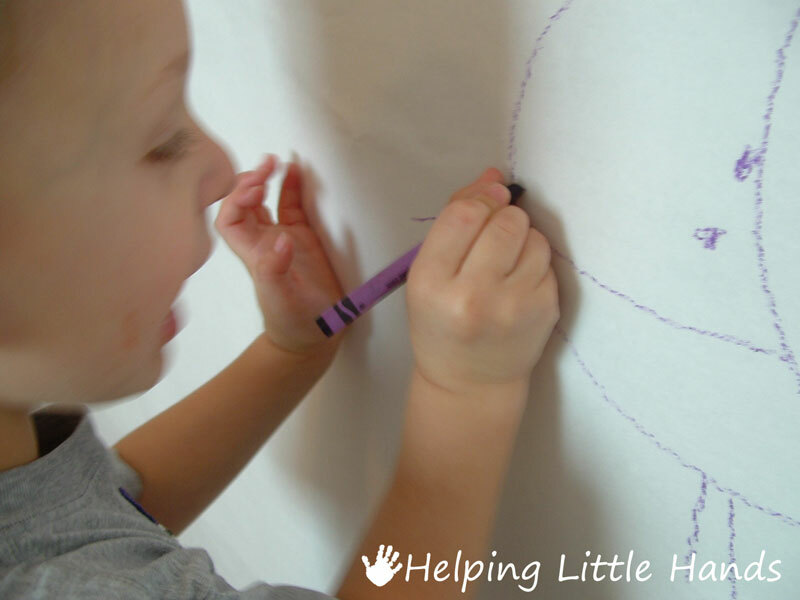 Pull out your purple crayons because we're going to color ON our walls with Harold. We actually did this for the first time a couple of months ago, so you may have caught glimpses of Little Brother's walls in previous posts. A couple of months after we moved into our current house Little Brother took a liking to coloring on his walls. 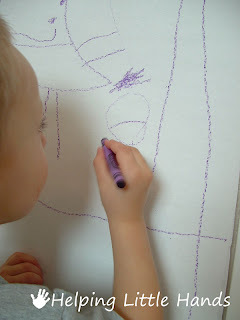 I guess we were being too slow getting the walls decorated, so he took crayons into his own hands and did it himself. I'd clean them off...and he'd draw on them again. We hadn't really had this problem before...and in case you haven't had the joy of cleaning crayon off of walls...it's a pain!! 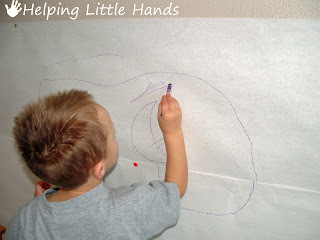 We finally decided to stop making this a battle and got a big roll of butcher paper. 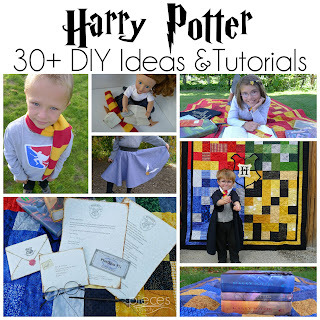 (Well worth the investment in my opinion...it will help ensure that Little Brother survives to adulthood...and it can be used for lots of other fun projects with the kids.) 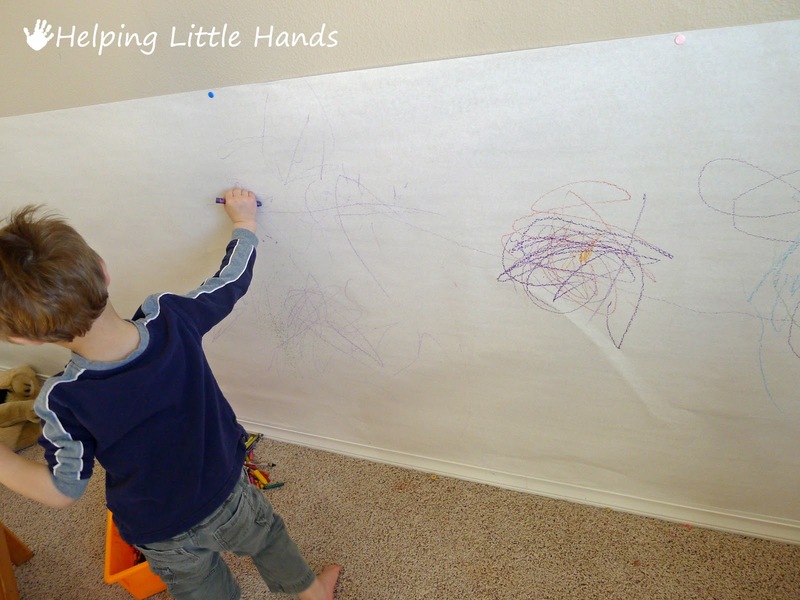 We covered his walls with it to about the height that he could reach. I figure the tiny holes from the thumb tacks holding it up are kinder to the walls than the constant coloring and washing of the walls. 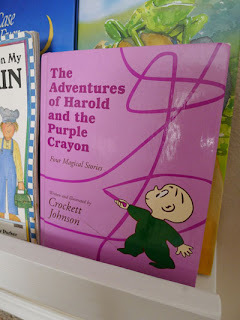 For those of you who aren't familiar with Harold and the Purple Crayon...Harold has a tendancy to wander at night when he's supposed to be in bed. 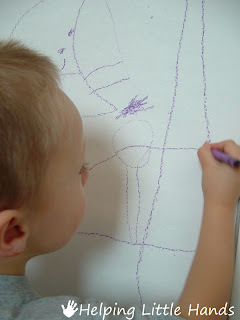 He uses his purple crayon and draws whatever comes into his imagination. What I really love about the Harold and the Purple Crayon books is how simple the illustrations are...and yet they capture my kids' attention. 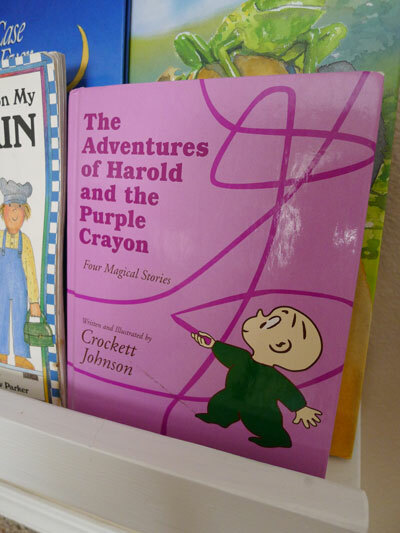 I also love how Harold's imagination runs wild and takes several unexpected turns in each story, but Harold's wits and his purple crayon save him every time. It's also a fun read for me, because I remember these books growing up. The first time I read it to Little Brother, I stopped at every page and had him draw the story. 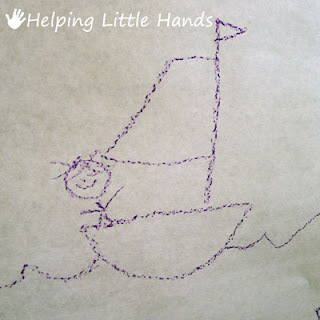 Little Brother's drawing skills are just emerging to barely recognizable images. I drew the moon shape and he added the arms, legs, and face. 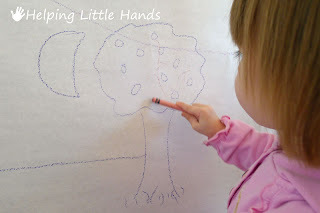 He also had a lot of fun drawing the monster underneath the apple tree. And when we were done and it was time for Little Brother's nap, he had me draw another moon (which follows Harold all through the story). Then Little Brother drew a window around the moon, just like Harold did...and settled down to sleep. We've read it many times since the first introduction. Recently it was time to replace the butcher paper on Little Brother's walls (because eventually it gets torn or pulled down), so we read it again with some fresh paper before of. This time the kids wanted me to do some drawing. And then helped color it in. There's something about a piece of blank paper bigger than they are that kids LOVE! It's really fun to watch them explore it. Then we replace it every so often so they can start over. When they're driving me crazy because they're bored, and I'm trying to make dinner...it's kind of fun to go tell them to draw on the walls. And to answer the question you're probably asking yourself...it has mostly curtailed Little Brother's wall drawing in other places. Brilliant. 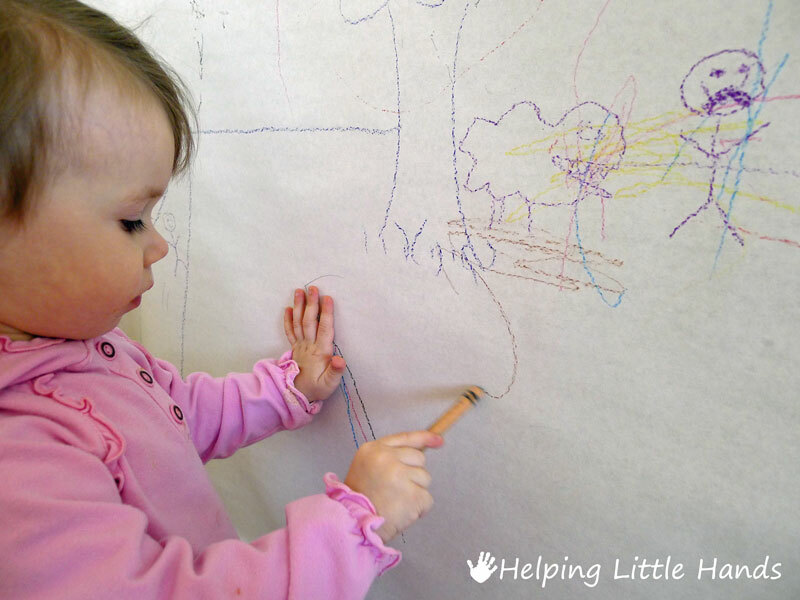 Walk away from a battle AND build art and literacy and imagination skills all at the same time. Where do you buy big rolls of butcher paper? GREAT idea! we love harold. this will absolutely be happening at our house. 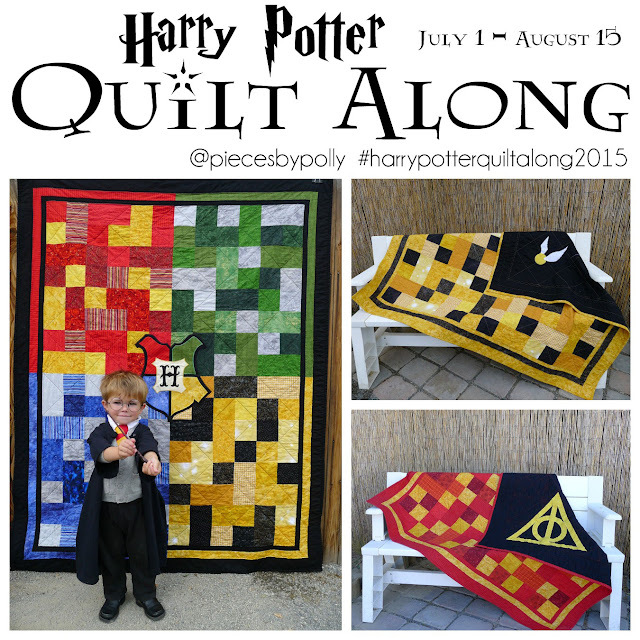 i'm linking it to today's blog too! Love this! Especially for dinner prep time, like you mentioned, aka "meltdown time" at our house. Great idea! What a great idea! I have a long hallway wall where this would be perfect. And wouldn't that be a great idea at an art party? Or as a break the ice activity for kids? So clever! Thanks for sharing. That is an awesome idea! my youngest sons drawings have covered his walls and extended to the hallway and his big brother's room. I guess he ran out of creative space. LOL. We have HUGE rolls of blank newspaper since hubbs works a the paper. I bet this will do the trick! And I love the Harold books. I had forgotten about them until I read your post! So fun! I don't have that book, but I've been wanting to get it. Now I have a perfect idea to go right along with it!